Discussion in 'Java Update' started by Joe, 7/4/19. AI is in plain English: man-made Intelligence. Exactly as in Vietnamese: Trí Tuê Nhân tao. The word Intelligence is here in English a bit imprecise. More precise it is in Vietnamese "Trí Tuê". And "Trí Tuê" is "Knowledge". Without knowledge there's no intelligence. The right use of knowledge and intelligence is then the Wisdom. What is intelligence? What is knowledge? The intelligence bases on knowledge. That's the matter of fact. The more knowledge accumulates, the more intelligence is increased. Human and animal as well gain knowledge by observation and deduction. A wrong deduction leads to memorized experience. And experience is the base of knowledge. Example, if we touched an unknown insect (observation) and were stung by it, and it hurt immensely (experience). From this unpleasant experience we deduct a knowledge that this insect is dangerous and we won't touch such an insect again. With this new knowledge we were able to share or to warn the others by telling them about the dangerousness of the similar insects ahead (intelligence). Intelligence is individual and personal. Even a pair of monozygotic twins doesn't share the same intelligence. It's the matter of fact that people whose knowledge could be the same draw very different conclusions. Therefore knowledge is an individual and personal deductive process. A process of 4-Nesses. The S.C.A.R. And intelligence bases on Knowledge. The consequence is: "natural" intelligence bases on a deductive process, not on a designated process which always produces the same equality, the same exactness, the same absoluteness and the same resoluteness. Man-made intelligence is the reflection or the mirroring of natural intelligence: AI or Artificial Intelligence is also an active process. We have learned that a deductive process is individual and personal. AI is also individual and personal, too. A process of S.C.A.R.. Similarness, Commonness, and Approximateness Relativeness. Hence it's impossible and possibly wrong if we try to create an AI system that can be multiplied, and they all produce the very same results. The laws of S.C.A.R. are broken and we get a dumb (but somehow "shrewd") system. Not a real Artificial Intelligence system, but a passive AI System. The on-the-IT-market available AI libraries such as Tensorflow, Matlab, etc. are therefore considered as the "AI automation tools" for a computerized, passive AI System. Because of the same "library" the computerized, passive AI System always produce the same decision under the same conditions. And that is against the law of individualism and personalism. If we want to build an active AI system we have to create an individual-personal system that could make decisions on its own knowledge, not on the knowledge that bases of a common-multiple-user-library. Otherwise we just have a "shrewd automat" that just follow and do exactly what the library dictates. The crash of Boeing 737 Max 8 in Indonesia (Lion Air) and in Kenia (Ethiopian Airline) is the result of a shrewd, but not intelligent automat. Boeing AI works with a sensor which delivers the needed data for a maneuvering decision. It works so far with the Equalness, Exactness, Absoluteness and Resoluteness that there's no individual and personal room for an own decision. And the results were fatal: the same crash under the same conditions by the same delivered data. What's next? Whatsoever AI is the reflection of human intelligence. And human brain is individual and centralized if you so will. Knowledge is different from irritation or stimulation. Irritation always triggers an according unconscious reaction. For example, if our foot hits an obstacle and we fall forwards we automatically push our arms with spreading hand forwards to cushion the (heavy) fall. Such a reaction requires a quick processing of data (fall forwards) and locally (arms, hands). Therefore our spinal cord is "stretched" along the back. On the other hand, knowledge, as we already know above, bases on conscious "calculation". And calculation requires power. Our brain is therefore the most powerful Central Computing Unit -the CPU (or Processor)- with abundant "built-in cache and memory. The CPU is itself a network of neurons (Neuron Network) or a network of processors if you so will. We human start to mimic our brain and build a "networked" computer. INTEL® CORE™ i9-9900K PROCESSOR is for example a network of 8 cores (each core is a 32-bits processor). But the computing power of our brain is still unmatched. Even with the most futuristic Quantum Computer. An "autistic child" can deliver a precise result of the most complex equation faster than any known supercomputer. With our powerful computing might we are able to store, to access and to process data instantly. The outcome is a decision, an action or whatsoever which is always the most actual. It's the deduction of knowledge. Knowledge must be existed (stored), available (accessible) and materializable (deductible). The most basic condition for AI is also the deductibility of facts (data) which are usually presentable in mathematical or physical descriptions. For example: A circle consist of uncountable number of referent points that have the same distance to an anchor point. A pentagon is a circle with 5 referent points, a Hexagon is a circle with 6 referent points, etc. The math. description of a circle is the number referent points and their distance to an anchor point (called the radius). The knowledge of a circle is the known referent points and the radius. The decision on a shape whether it is a circle or not bases on this math. knowledge. If an AI system needs to decide on a shape with 5 referent points that share the same distance to an anchor point whether this shape a circle or not it depends on the deduction of S.C.A.R. -Similarness, Commonness, Approximateness and Relativeness. A computerized passive AI System will say that the shape is NOT a circle, but a pentagon or a hexagon. And that is the fundamental difference between active AI and passive AI (computerized machine or shrewd automat). The S.C.A.R. laws allow dynamically to make a decision that bases on the most actual conditions. The dynamic is flexible and different from case to case. Similarness: A pentagon or a hexagon resembles a circle drawn by a child. For an active AI system it's sufficient enough to deduct that the drawn shape is a circle. A passive AI system rejects such a deduction that simply bases on a resemblance. Commonness: Because an infinite number of referent points is unachievable unknown shapes are recognized by their commonness. A pentagon or a hexagon share commonness: the distance of all referent points to the anchor point is the same. Approximateness: the resemblance is more visible and more reliable if more referent points are sampled. Theoretically 2 referent points can be deducted as a circle with the anchor point in the middle of the line between the 2 referent points. Approximateness is crucial for a crucial decision (Boeing 737 Max 8). Relativeness: the flexibility is the base of every decision. Any restriction could lead to rigidity and limits any possibility to construct a final decision in case of decision deadlock. Man-made Intelligence is NOT natural Intelligence. AI bases on the Knowledge which is derived from human knowledge. Natural Intelligence is the accumulation of evolutionary knowledge. And this accumulation is invisible and inaccessible by human. It's a natural process whose evolutionary knowledge is stored over millions of years in the DNA strand. Emotion is individual and personal. The rate of emotion cannot be scaled or weighted by any available mean. Every rating is always perfunctory. Never perfect. Hence AI cannot rate the feeling or gauges the emotion. The try of Volvo to monitor the face of the driver at driving and to deduct a conclusion of his moody state is deceptive because the intention of the driver to cheat is invisible for the monitoring cameras. Extrapolatability is individual and personal, too. The seriousness of a sentence depends, for example, on the pitch of the speaker or the way how the speaker said. A loud you can be either a friendly warning from a danger or an unmistakeable contempt. Interpretability is invisible and ambiguous. A polite rejection is usually very friendly, but uttermost unmistakable. In some cases a friendly YES is an unbridgeable, polite NO. Therefore AI-driven translator is always mediocre, never perfect (like human) and in many cases the translation turns out a nonsense. Rationality and Irrationality are uttermost human. Decision depends on his temper or on some unknown reason (e.g. sympathy or apathy or hostility) and it can be very different on the very same matter. The prejudice is, for example, the most irrational decision of human. Why Vietnamese hate the Chinese so much ? Because China invaded and colonized Vietnam. Vietnam was invaded and colonized by France, too. But why Vietnamese don't hate the French as much as the Chinese? Or: why Chinese deeply hate the Japanese? Because Japan invaded and defeated China. China was invaded and defeated by Great Britain, too. But why Chinese don't hate the Brits as deep as the Japanese? It's the Prejudice. Prejudice cannot be mathematicalized or physicalized. And AI bases on Mathematics or Physics. Imaginability is the most complex ability of human. The ability to see the unseen and to materialize it. For example, we imagine how "Demons", "Ghosts", etc. look like and then we sculpt them according to our imagination. It's impossible to formulate an imagination in any math. formula or to render it in any physical form. Religions are the most visible, the oldest existence of human imagination. Fantasizability is also a very complex for AI-izing. Fantasy is the work of human brain which creates images or actions from nonentity. Dream or Fantasy is so individual and so personal that, for example, any description about it triggers the hearers their own dream or fantasy. Their individual and personal dreams or fantasies. Learnability is the most unique ability of human (and animal). If a child got hurt by fire it quickly learns that fire is dangerous. Not the form of the fire that hurt it, but any form or appearance of fire. It's the learnability that allows human to extrapolate, to conclude and to deduct the impact. The complexity of human Intelligence is so tremendous that a Humanoid (man-made human-like robot) can and will never match human being. Can you imagine that a humanoid falls in love with another humanoid? I can't. AI Implementation is difficult. Very very difficult. Human knowledge is an accumulation of millions of evolutionary years of knowledge which is in most circumstances impossible to reflect or to describe in mathematics or in physics. Imagination or irrationality is, for example, the product of evolutionary knowledge, not a product of Mathematics or Physics. And without Mathematics or Physics AI becomes a coded sequence of dumb actions. Nevertheless there are a lot of human knowledge which can be solved by mathematics or physics. The Dijkstra algorithm is, for example, the search for the shortest path between two locations (or nodes) among numerous possibilities (locations). In reality we usually cut short our way in order to be faster and to lessen our effort (from walking). Dijkstra's Algorithm calculates the distances and decides which distances are the shortest so that the distance between the Begin and the Goal is the smallest sum of connected distances. This example demonstrates how Mathematics is applied to solve a human knowledge: cut short the (walking) distance. Nothing is fancy in Dijkstra math. algorithm. Only addition and comparison are involved. But the sequence of calculation-Comparison is decisive. It's the algorithm. AI is a sum of implemented algorithms. Our networked neurons (brain) possesses an unknown (or unlimited) number of sleeping algorithms which are waiting for us to be detected and to be woken up -like the Dijkstra Algorithm. The detecting base (of algorithm) is the 4-Nesses or S.C.A.R.. The weighting of one of the S.C.A.R. determines how "specific" AI implementation should be. Pattern Recognizing sets its weight on Similarness. Face or Fingerprint Recognition is the most typical AI-application which works intensively with physical resemblances and mathematical similarities. Machine Learning works on the base of Commonness and Approximateness. ML could be either Supervisory or Unsupervisory Learning. A supervisory AI-Learning won't make the final deduction, but rather gathers the conditions that support the deduction which is then decided by the supervisor (i.e. user). An opposite is the Unsupervisory AI-Learning wherein it relies on its learned repository knowledge and makes the deduction from the learned knowledge by itself -without any intervention of its supervisor. The bad fate of Boeing 737 Max 8 could be the problem of self-deduction made by the passive Unsupervisory ML. Gaming is the most widespread AI application. Gaming ranges from Chess Computer to (Car) Navigation System. The Relativeness decides more about the deduction than the Commonness or Approximateness or Similarness. Alpha-Beta Pruning Search or MiniMax-Search, for example in TicTacToe, deducts the best move (node) from all the available moves. Or MRA (Map Reduce Algorithm) is used by Google to search for the most relatively resemblant pattern within objects out of a heap of objects. Warfare and Weapons Technology are the "most lethal" AI application. Herein all S.C.A.R. are applied. Kamikaze drones, smart torpedoes, intelligent missiles and so on are the last (and the stupidest) AI research and development. Unsupervisory AI missile finds its way to the goal based on its own repository knowledge and data fed by satellites and makes its own decision where to "seppuku" in order to create the most destructive result. However AI implementation requires a deep understanding of mathematics and a good imagination to visualize the (math) knowledge. The Cut-Short algorithm bases on two simple mathematical formulas: addition and comparison. Dijkstra's feat was the visualization of the Cut-Short knowledge with the 2 simple formulas. Simplicity is the key. Complexity is the dead end. Cross-Disciplinary working units to combine and to deduct an event in computable or representable form. It can do a lot, but not "naturally" enough as a real dog does. Further: Aibo cannot fall in love with another Aibo, can it? But the computing power is already amazing for some of us. The AI-driven Aibo bases on a sum of different knowledges which must be computed and deducted so that the movements become fluent. The more powerful the CU is, the more natural (i.e. fluent) the movements will be. Memory: Memory is passive, but vital for AI. Working Memory (RAM or Cache) and persistent Memory (Repository or Database) are the base of every AI interpretation and execution. The reason is simple, but unaware by some people: Knowledge is BigData and big data require more memory to work with (RAM/Cache) or to stow (Repository or Database). Reliable Input/Output Units (RioU): like human AI is not AI without RioU. Human needs eyes (visual), ears (sound), skin (sensing), nose (smelling), etc. AI needs sensors to interface the outer world -the human world. Like human's RioU AI-RioU must be reliable and steady available. Unlike human RioU which can be "kaputt" (broken) AI-RioU must be always functioning. The Boeing 737 Max 8 fate is the proof of a bad-functioning RioU (sensor at the airplane nose). Working Units (WU): The RioU are controlled by WU which must be able to coordinate and to work in sync with other WU. On human a noise (ears) triggers a head movement to the source of the noise so that the eyes could visualize the cause of the sound -just for a knowledge about the sound. A complex cooperation between different WU: ears, neck muscle, eyes. The more AI-WU frictionlessly cooperate the more AI becomes natural. Aibo dog needs more synchronized cooperation between the WU in oder to behave like a real dog. What is fuzzy? Fuzzy is in lay language "unsharp", "unclear", "blurred", "vague". Fuzzy Logic is a logic that expresses an statement which is relatively near, but not exactly to the core. It's the nature of human whose expression is usually blurred, unclear and sometimes quite ambiguous. For example: "I don't feel good". The rating of "don't feel good" becomes ambiguous and unsharp, too. Such an "expression" would lead to the question that would be "why you don't feel good? ", or "what's wrong?". And the answer for the question is just "a bit" more precise, but still quite ambiguous (e.g. "I drank yesterday too much", or "I got a bad night", etc.). Such an ambiguity is the logic of "free rating" and "free rating" lets no room for an alternative. It is based on the observation that people make decisions based on imprecise and non-numerical information, fuzzy models or sets are mathematical means of representing vagueness and imprecise information, hence the term fuzzy. Impreciseness and Vagueness are the foundation of Fuzzy Logic. to handover the replies from the web to each individual browser. It's clear that the classic architecture is Client-Server where the clients are the browsers and the web and the server is the Web Proxy. The server produces each thread that serves in between browser and the web. The latent time between browser and the web is crucial. This latent time is the processing time of server or the Web Proxy. The longer the processing time is, the more the latent time becomes. And the latent time is for the users no other thing than the response or reaction time of the server. A long response time is for the user usually inacceptable. The rule of Fuzzy Programming is simple. It's restricted itself on the knowledge that the data are bound to a known set of values (as keys or commands) and each value is unambiguous. The Browser requests base on the HTTP protocol which has a set of unique commands like GET, PUT, POST, CONNECT, etc. And the Web responses base on the HTTP protocol, too. With this knowledge we are able to implement a Web Proxy in Fuzzy Programming technique. // search for "Proxy-Connection: keep-alive"
// if all 3 conditions are met we assume that the word "Proxy-" was found. System.arraycopy(buf, i+7, buf, i+1, len - 6); // remove "Proxy-"
Assumption that a keyword (e.g. "Proxy-Connection") or a pattern is then found if n letters match the same positions of the keyword/Pattern (0, 1 and 5). Instead of Checking for the whole keyword/pattern (or part of the keyword/pattern) only n unique letters are check at n determinate positions within the keyword. Pattern Recognition bases on such a Fuzzy Programming. Assumption that the Probability (the "rate of Similarity") with n samples (here: the positions) should be so reliable that a deduction could be optimally achieved (up 0.5). Google Search Engine (GSE) works with Map Reduce Algorithm or MRA which is no other thing than Fuzzy Programming. MRA calculates the so-called "Term Frequency" or TF which is the frequency (or occurrence) of a term (or an expression, e.g. "Proxy") within a document (or object) and then the Inverse Document Frequency or IDF which is the weight of TF within a heap of documents. With TF-IDF GSE is able to deduct some search results whether they are the same or just similar (e.g. how much similar?) The deduction is based on the calculation "CosineSimilarity". Some words about CosineSimilarity: We know in the trigonometry that cos(0°) is 1 and cos(90°) is 0. A range between [0, 1]. An angle of 90° indicates a perpendicularity. An angle of 0° signifies a parallelism of objects. Parallelism is in the geometry the similarity between two lines: the CosineSimilarity. Cosine similarity then gives a useful measure of how similar two documents are likely to be in terms of their subject matter...The technique is also used to measure cohesion within clusters in the field of data mining. And AI bases on Similarness, Commonness, Approximateness and Relativeness. Back to our Web Proxy: with FP we can enhance our Web Proxy with more features, for example, a blacklist (of perversive ads), Cookie-Filter, a bridge to other networks (e.g. TOR network), etc. The full codes can be downloaded here (either with ZIP or with JZIP). The "pure" lore of Fuzzy Logic is the work of Lotfi Zadeh. FL relies on Mathematical Probability and basses on Set Theory (ST) and for "the ease of vague understanding". CL is binary and crisp while FL is ambiguous and vague. CL object have two distinct states (entities) which are determinable while FL objects possess numerous states which can be vague and overlapping. CL state (or data) is final while FL state (or data) is variable and imprecise. FL Operations must be able to operate on the vague state of FL objects so that any transition between the states could be rendered. Because there's NO distinct transition between different states the ST operations (AND, OR, INVERSE, EXCLUSIVE/INCLUSIVE OR, INVERSE, etc.) can be optimally applied to FL. I don't go into details with Set-Theory operations, but hint you to see the given link above, or to Google for more if you want to do some researches on ST issues. Or THIS. As we know, FL does not provide an alternative, hence the outcome is singular: room is cool. Nothing more. Nothing less. And the outcome (room) is also vague and ambiguous: cool between 8° and 18°. 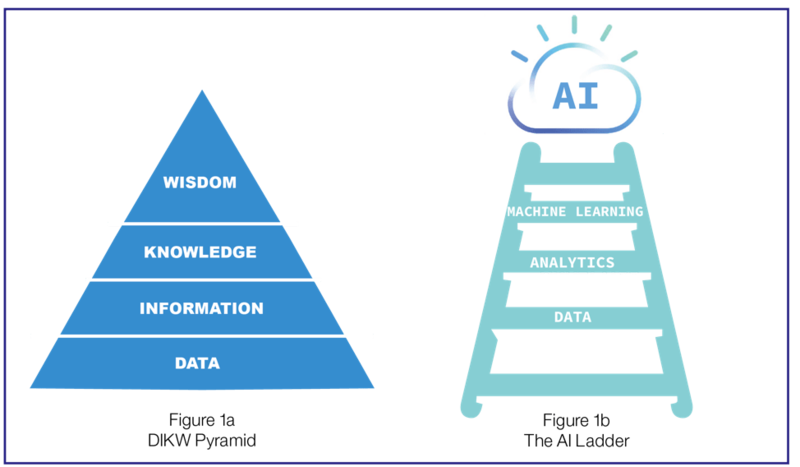 AI bases on knowledge and knowledge is big data. Data with complex and intricate ramification. Face or fingerprint or linguistic recognition is for example the most intensive R&D of today. However the results are mediocre. It isn't the inability of researchers and developers, it's the intricate ramification. And ramification can only be rendered by similarness and commonness of some certain traits. With FL we could convey some properties which mirror these features of the observing object. Face recognition appraises and measures, for example, the locations and forms of the eyes, mouth and nose and then deduct the face that has the most similar traits with a reference in an existing repository. Such a work is very time-consuming without FL. Machine Learning is another field that requires lots of detailed data. Big Data. If Face Recognition is extended to include animal faces more references must be established and validated (supervisor or unsupervisor). The locational details of eyes, mouth and nose must be reworked and categorized (human, animals, birds, insects). FL provides here the base for ML: dog-like (coyote, wolf, chihuahua, etc. ), feline (lion, tiger, chetah, etc.) and so on. Some IT developers think that AI needs AI-oriented language, Front-End requires JS and PHP, etc. They are wrong. All programming languages are suited to code AI applications. The knowhow, not the language itself is the key. JAVA or C/C++ is suited for AI as well. PYTHON is an interpretative language which can directly execute (the source codes) without compiling. And that was the lure to code in PYTHON (by researchers or developers who come from other fields than IT) to see how their AI-Idea works. Hence it's simple to work with "type-less" variables (int, float, double, etc.) because their types will be recognized and adjusted by PYTHON during the interpretative phase. And that can be done with JAVA or C/C++, too, as an AI engine which interprets the AI codes and execute them. Similar to an "AI-Engine" FL does not need a special FL language, but an FL engine that interprets the codes and executes them -exactly as PYTHON does. 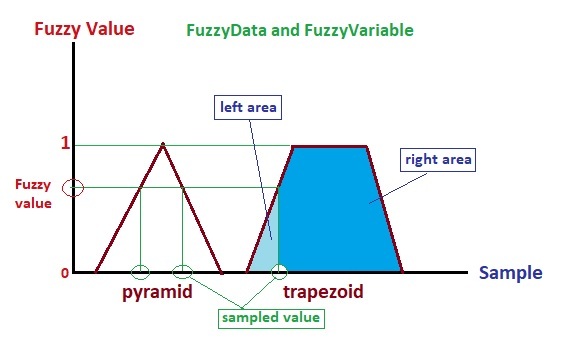 FL depends on FuzzyData and how the states (data) are arranged as pyramid or trapezoid. If the arrangements are contradictory FL could deliver contradictory result, too. The "ancient" naming for "Machine Learning" is "Automatization". Due to limited memory and mediocre processor "ancient" automatized machine is good, but not as intelligent as the modern "Machine" which can learn. Hence: Machine Learning. As discussed in previous chapter ML is AI that bases on a big repository knowledge. And knowledge is Similarness, Commonness, Approximateness and Relativeness. Such requirements suit the best Fuzzy Logic and FuzzyData is a state which describes an entity and ranges from X to Y -not determinate, but floating. The given example Room.java is a simplified Machine Learning in both modes: Supervisor and Unsupervisor. With 2 parameters Room can be controlled either by a "Supervisor" or "itself" the Supervisor (Unsupervisor). 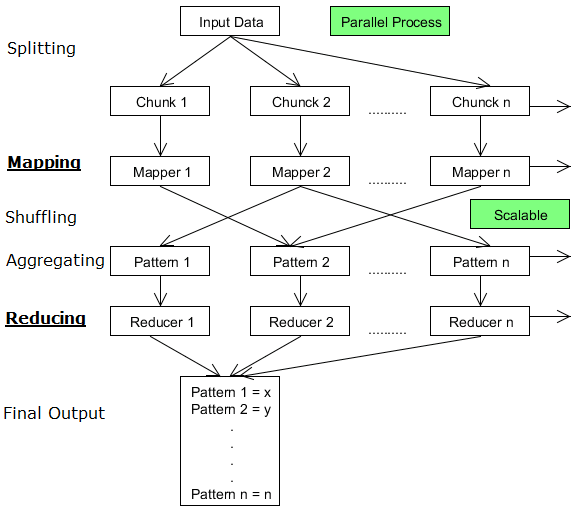 // - 2nd parameter (anything) is for Machine Learning. The following excerpt shows you how FuzzyLogic Expressions are interpreted and executed. For knowledge, too, itself is power. With Knowledge AI knows what AI's doing. And Knowledge must be kept and just-in-time available when AI needs it. Otherwise AI is not lively, but stonedead. I am talking about the AI repository. The brain (of every living species) is an unmatched repository with a lightning fast access. You see a face and know either this face is familar or unknown -less than a blink. That's the power of the brain and that makes every living species superior against any man-made robot -even the skrewdest AI robot. 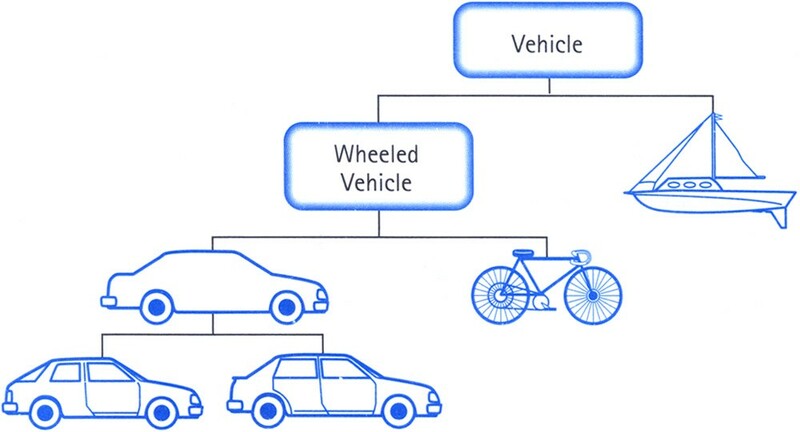 Knowledge about Vehicle leads to different types of vehicles, the type says about the object and the object indicates its own identity (e.g. sedan, SUV or hatchback). Such an object-reasoning and identifying require a specific object-oriented DB (OODB) or OO-Repository. However commercial OODB is too generic to fit for an AI work. This link gives you an overview about 9 available OODBs. I am myself never involving with any of these OODB. It's in my belief that AI needs OODB which is specialized to each individual AI purposed application. We are not able to cover everything like our brain, hence it's more apt to tailor a specific AI OO-Repository (OOR) for a specific application. It sounds costly and wasteful, but it's in my opinion cheaper and more useful for a long term thinking. Technology evolves and is always a new base for a new technology. AI developers don't need to develop a versatile OOR (like coding with PYTHON -regardless to its interpretative slowness), but see the additional OOR work as a necessary coding work to achieve the most optimal AI application. Mother Nature has showed us that every living species has its own OOR. It isn't a costly-and-wasteful work of Mother Nature. OOR should be also a "home-made" OODB because a generic AI is impossible and unfeasible. Face or Finger Recognition is, for example, different to DataMining with an AI-search algorithm. Their data are specific and therefore they must be treated differently. Java (or other OOPL) Objects are linguistic object-bound and can only be processed by their own methods written in Java. And that makes sense to build or to develop an OOP-specific OOR. To do that Java Objects need only to be Serialized. Serialized Java Objects can be stored, fetched and processed by their own "knitted" OODB methods. 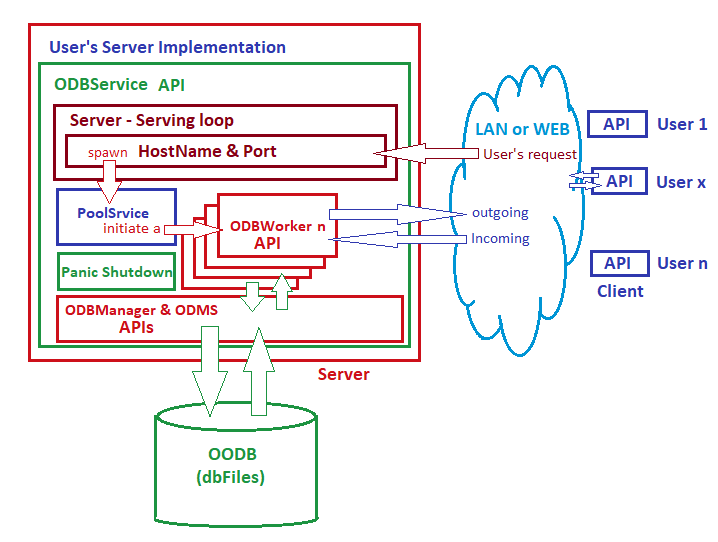 The schematic of an OOR can be simple (flat file) or complex like a professional OODB (Client-Server). It all depends on the requirements and your IT ability to be capable to develop such an extra work. Coding is already a work. If one learns to code one should learn to design one's own "data container", too. The Object-Oriented Repository. The (OO)DB foundation is simple: IO activities. It's the lowest level. All DB-IO activities rely and to be dependent on the host Operating System and its subsystems (disk, USB, etc.). IO means file IO. File leads to file-system. And you have two choices: use the default file structure or invent your own. The first option is simple, but it does not give you much room to maneuver. You have to work with OS conventions and OS formats -with all their advantages and disadvantages. The last option requires you, as DB Designer-Implementer, to be creative and inventive. Here you can set your own conventions, your own formats and your own (file) structure. I show you hereunder the last option. - How can I save my data optimally? Are there different ways to compress data ? Also, what compress technique should I use ? Does the compression process take more time than a system-conventional WRITE of NON-compressed data? - How can I read my compressed data as fast a s possible ? Does the decompression process take more time than a system-conventional READ process of NON-compressed data ? - How can I optimize the compression and decompression process ? - How can I access the data correctly and efficiently ? The FileChannel implementation applies nio to exploit the bock-wise IO processing. It looks a bit awkward and somehow slow. Yes. It could be slower than the byte-wise implementation. But as long as the DB file is small (less than 100KB) FileChannel is at disadvantage. The situation reverses when the DB file size increases (up more than 100KB). Before I shows some examples let's complete the self-built OO Repository and talk about Design & Implementation of Data Integrity and Data Consistency. The odb-package can be downloaded hereunder.
! KeyLength ! ObjectLength ! Key/ObjectName ! Object ! Key/ObjectName is the readable name of the following object. It must be unique. Object with the size of max. 2G Bytes. An object could be a serialized JAVA object, or a byte-array which could be object of other OOPL, a content of an image/sound file, or an URL link to another object, etc. Note: if the byte array of an object is the content of a file (e.g. image) it's wise to use its name as the key/objectName (e.g. JoePicture.jpg). However, image/sound files are usually big it's better to keep them where they are and use their name as reference (absolute path or URL if they are on the WEB). Then we apply the GZIP compress technology to our dbFile in order to reduce the physical size of our dbFiles (up to 60% -see screenshot of Part I). Depending on the "UserRight" open() automatically create an empty DB file if there isn't a dbFile under the given dbName. The UserRight could be: ReadOnly, ReadWrite and ReadWriteDelete. ReadOnly users can only open existed dbFile. If the dbFile under the given dbName exists its content will be loaded into an ODMS cache (HashMap). Nevertheless, the caching mechanism (or algorithm) should be modified or devised if your dbFile grows too big (e.g. hundreds of objects with the size of some GB) or your DB server's scarce of RAM capacity. Data Integrity and Data Consistency depend on the way how we access the data, how we make sure that the data are consistent, persistent (i.e. integrity) within a multiuser environment. 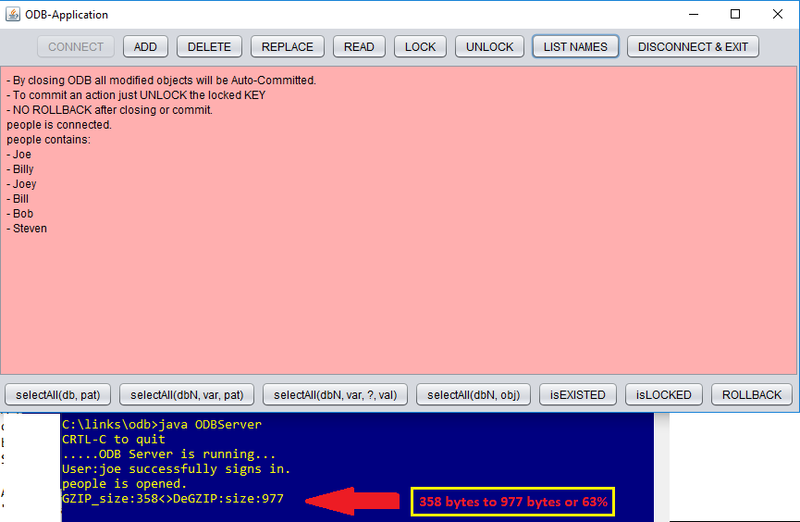 Before we go into details let's complete the accessing mechanism of our DB file. We set the next convention for the naming storage: for the ease of use we decide that our DB files should be grouped in a common directory -says: [current_Directory]/obb/dbName] or [current_Directory]\obb\[dbName] on WINDOWS, where dbName should be without suffix. Example: dbFile is "employee". The complete ODMS.java. This implemenation is an example showing you how the basics of an Object Data Management System is implemented. You can enhance or modified it to suit your requirement. Note: However, you have to mention the copyright (C) of the author Joe Nartca and Congdongjava.com as the source. The author and Congdongjava.com are NOT responsible for any loss or damage of your data. You're on your own. In a multiuser environment users, or to be more precise applications, compete for resources. Either all resources are held exclusively by ONE user or they are shared by all users. The first option is simple to implement. User who needs a resource gets it or has to wait for it till it's release. No locking or unlocking mechanism is required. But the processing time becomes unpredictable. Due to waiting for resources some applications appear to be hung up. Such a design & implementation is obsolete. Sharing resources? Yes. The most optimal option. Modern design bases on the Client-Server principle: a joint server serves all clients and distributes the competing resources equally among the competitors. However, the design and implementation vary from application to application. But the principle stays unchanged, Design & Implementation could be vary from application to application. A flexible design is to build two common frameworks on each side: client and server. The frameworks are in our design & implementation the APIs (Application Programming Interfaces). UserX sends a connection request to ODBServer (host/port). ODWorker finally picks the result (see ODBResult) and sends it back to its partner UserX. Fig.5 shows you how Data are cached and how they are managed. 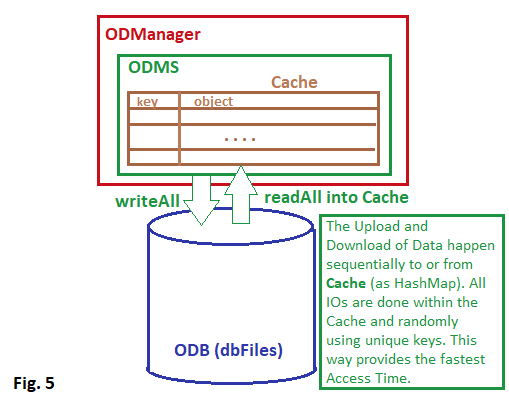 On open all data are uploaded into ODMS Cache (JAVA HashMap). All subsequent IOs happen within this Cache and in a random manner of Key-Data: also with key as the accessing index. This way (HashMap) provides the fastest IO-access time. ODBService. This API provides its users the possibility to design their own GUI-driven ODB Server. The invocation is simple: 3 parameters for the constructor (String config, port number and an OutputStream for the logger). If you have WEB users as clients you have to Port-Forwarding the given port. More about Port-Forwarding you'd consult your MODEM's manuals (or click HERE or Google with the keyword "Port Forwarding"). ODBWorker. This API is started internally by ODBService. If an user connects to ODBService it spawns an ODBWorker which is executed in StealingPool and works exclusively for this user. ODBResult. The interchange of outcomes between Server and Client is wrapped in ODBResult. Again, this API is a template. You should enhance or modify this POJO to cope with your personal requirements. ODBService employs ODBManager API (which manages the IOs with ODMS API) and passes it as a mutual parameter to its children (ODBWorkers). To ensure Data Integrity & Consistency, and to shield OODB from unwanted abuses Server and Client should be usually protected by Password and (unique) UserID. I include an API UserList into this odb package. However, UserList requires some protective encrypting-decrypting algorithm. The best protection is an algorithm which is known only by you yourself -nobody else! Hence you have to devise some encrypting-decrypting algorithm for yourself. An Encrypt-Decrypt template -to be developed. To ease your (temporary) work I include in the package my own EnDecrypt API (144 bits algorithm without source) so that you can immediately work with the package. Of course, you can use this API as long as you want. It's free of charge. (The link to download odb.jar will be available at the end of this series). The include userlist contains 1 user. Password: joey, userID: joe.
! encrypted Password:UserID ! @ ! Privilege ! @, 1 byte, is the separator between encrypted PW:uID and user's privilege. @param uFile String, userlist file (abs.Path). @return String array contains all users as "pw:uid@privilege"
The password and userID will be encrypted before they are sent to ODB Server. If the authentication failed ODBWorker sends an error message to its "client partner" and waits for the next "retry". Note: As usual, if you modify or enhance the sources you have to mention the copyright (C) of the author Joe Nartca and Congdongjava.com as the source. The author and Congdongjava.com are NOT responsible for any loss or damage of your data. You're on your own. For FuzzyLogic I'll show you more on the next posting "How to implement a full-functional FuzzyEngine (syntax and scripts) and How to integrate FL into and with JAVA". they could be null or 0. Registered JavaObjects must be instantiated, before they are registered. Otherwise Exception will arise when they are referred. + - * / = : . The given ZIP file contains 5 files showing you how Map Reduced Algorithm works in "Data Mining" in a "big" directory. It's written in SWING and self-explained. If anyone of you, mon ami Nancru and all CDJ members, can post your question(s) here and I'll try my best to give you a satisfactory answer. Up 12. Mai 2019 - end Juni 2019 I'll be absent here (on vacation in north Vietnam and in south China).